First official record: a fragment from the King's Office of the Revels, dated 1619, includes a list of plays which may have been recently performed at court. 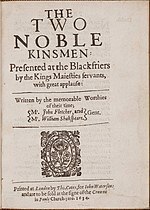 Two Noble Kinsmen is one of the plays mentioned. First published: published in quarto in 1634 (printed by Thomas Cotes for John Waterson). First recorded performance: although the play must have been staged prior to October 1614, records of early productions are vague. The 1619 list may be a list of recently performed plays, but it could also be a list of plays proposed for future performance. The inclusion of two actors names in stage directions in the 1634 quarto text (4.2.70.1 and 5.3.0.2) suggest the play was staged in 1625 or 1626 (the actors mentioned are "Curtis" (probably Curtis Greville) and "T. Tucke", (Thomas Tuckfield), both of whom were with the King's Men for the 1625–1626 season only). The quarto text also claims the play had recently been performed at Blackfriars. However, the earliest known performance is in the form of William Davenant's adaptation The Rivals in 1664. The earliest known production of the straight Shakespearean/Fletcher text was in The Old Vic on 28 March 1928, directed by Andrew Leigh. Additional information (attribution): attributed to Shakespeare and Fletcher by both the Stationers' Register entry and the 1634 quarto, there is also much internal evidence that the play was a collaboration between the two. Studies of vocabulary, metre, imagery, pause patterns, the treatment of sources as well as linguistic analysis and rare word tests all suggest the play had two distinct authors. Shakespeare is thought to have written Act 1, 2.1, 3.1, 3.2, and most of Act 5 (except 5.4). Evidence: the morris dance in 3.5 borrows from Francis Beaumont's The Masque of the Inner Temple and Gray's Inn, which was performed at court on 20 February 1613, probably by the King's Men. A terminus ante quem is fixed by Ben Jonson's Bartholomew Fair, first performed on 31 October 1614, which twice sarcastically refers to "Palemon"; Palamon is one of the protagonists in Noble Kinsmen. This establishes a date of composition sometime between February 1613 and October 1614. The argument has also been made that the play may have been commissioned specifically for the festivities surrounding the marriage of Princess Elizabeth to Frederick V, Elector Palatine in February 1613. At the time, the country was still in mourning for Prince Henry, who had died in November 1612. Henry was devoutly Protestant, a keen proponent of chivalry and was delighted with Elizabeth's choice of husband. Until his death, he was the main planner behind the wedding celebrations and it has been speculated that perhaps Beaumont's The Masque of the Inner Temple was written to cater to Henry's penchant for chivalry. Geoffrey Chaucer's "The Knight's Tale", upon which Two Noble Kinsmen is based, is a chivalric romance, and would have been especially fitting for a wedding organised by Henry.